I live in a micro studio apartment with no balcony or porch. I started out with an 18 quart bin under my bathroom sink. It did well, so I learned I could keep worms alive and reproducing - yay! I bought a heavy duty tote from Lowe's for about $18 with tax, that is black with a flip top. 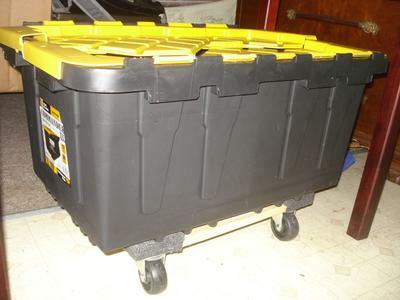 I wanted a sturdy, heavy duty tote that wouldn't crack if/when I move. It has a bunch of grooves in the bottom of the tote inside, though, and I could just imagine trying to get worms and castings out from those grooves. So, I lined the tote with a doubled over tarp that I cut to size. I put it on a wooden mover's dolly that I got from Harbor Freight with a coupon for about $9 with tax. The bin is now under my kitchen table/island in the middle of my micro apartment. I will cover the table with a table cloth that will go to the floor, to hide the bin. And I can roll it out when I want to check on the worms, or roll it out of the way, if I want to sit at the table with someone to eat, so we can put our feet under the table. I really like that this lid flips open in two halves. I don't have to find somewhere to put the lid when I need access to the worms. Any space-saving feature is great for me. The top can be locked closed, as the two halves are designed to interlock, and I may use this feature if my dog decides she is interested in what's in the bin lol! But, until then, I can leave it unlocked, which allows more air to get in the bin, by not closing it securely. I did not drill any holes in the tote. 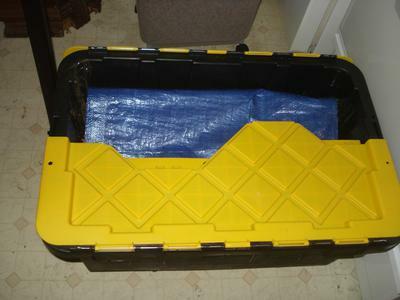 I live in a very dry climate here in Redding, CA, and I learned with my bathroom totes that they will not get too moist in a plastic bin with no air holes drilled. I simply leave the tops off of the bins in the bathroom, and those are wrapped in a plastic bag loosely. As far as bedding, I use coir, and I was able to find some loose (not in a pressed brick) with very low salt content at a local hydroponics shop - the brand is Canna. They also don't use steam to sterilize their coir like others do, so the beneficial microbes are alive in this coir. For my first bin I bought a brick of coir and rinsed in my bathtub - what a mess! And I lost half of it down the drain. I was happy to pay a premium for this low-salt, loose bag of coir that comes with some live microbes in it. I added composted horse manure I got locally. Added organic oyster shell flour (about 1 part oyster shell flour to 10 parts bedding). Added some shredded brown paper bags, paper towel rolls and toilet paper rolls. I have found that shredded white paper clumps in the bedding, so I only use brown now. I then added some of the bedding from my established bathroom bins, so there would be lots of yummy microbes for my new worms. And then added a pound of worms that I bought locally. I raise Eisenia Fetida, red wigglers. I will keep my bathroom bins, too (there are now two 18 quart bins under the bathroom sink), just in case one or two bins crash for some reason, I won't lose all of my stock. My apartment is kept at 80 degrees during the day and 75 degrees at night during the summer. In winter, I will probably keep it at around 63 degrees in here. So, reproduction will likely go down in winter, but they won't freeze. I feed very small amounts of kitchen waste that I bury or it will smell in the bins. I deliberately don't feed much kitchen waste because I end up with gnats and fruit flies in my apt. You can freeze your kitchen waste to avoid this, but I don't have much freezer space either. So, I mainly feed composted manure, shredded brown paper and newspaper, brewed coffee grounds and used coffee filters, and home-ground flour made from random grains I have around the house - dried rice, beans, and oats so far. I am a low income senior, and go to the senior food giveaways, and get a lot of dried rice, beans and oats that is more than I can eat. So, it goes to the worms. I plan to use my castings for my indoor garden. For now, I have a small garden on my dresser top (about 47 x 20 inches) with a grow light above it. Right now I have cherry tomatoes, basil and marigolds. They're about done, and next crop will be bok choy, a small sweet pepper and some pansies for fun. WoW Karen! There's a whole lot to talk about here but I'll keep it short. You definitely did your homework on this one. It's the king of all totes and extremely sturdy and will last a long, long time. Great bedding material (coco coir) and worm friendly. I love the easy roll-around dolly and I also noticed that you have nothing underneath to catch the leachate. You are doing it right when there is no leachate as the material should remain like a moist sponge for best results. AND...growing plants and making castings all in a studio apartment is very encouraging to many people out there who think they can't do it if they don't have land or some type of garden outside. Thank you for your photos and story you will inspire many people. Thanks for all the information. Even I could understand it ! What a relief to know you can still do a little farming, even in a small apartment. Your garden sounds wonderful, thanks for the encouragement! Karen I can't say it better than Pauly: "WoW Karen!" Your farm is really ingenious!